Dorothy Cheney and Robert Seyfarth, authors of “How Monkeys see the World” and co-authors of “Primate Social Systems” have published yet another thought provoking book on their studies of baboon. In 1838 Charles Darwin jotted in a notebook, “He who understands baboon would do more towards metaphysics than Locke.” Baboon Metaphysics is Dorothy L. Cheney and Robert M. Seyfarth’s fascinating response to Darwin’s challenge. Cheney and Seyfarth set up camp in Botswana’s Okavango Delta, where they could intimately observe baboons and their social world. 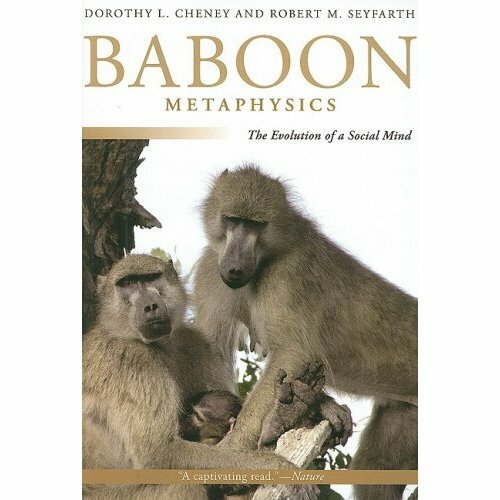 But Baboon Metaphysics is concerned with much more than just baboons’ social organisation- Cheney and Seyfarth aim to fully comprehend the intelligence that underlies it. Using innovative field work, the authors learn that for baboons, just as for humans, family and friends hold the key to mitigating the ill effects of grief, stress, and anxiety. I found this a very interesting read, and it’s a must for everyone who thinks that social comparisons between humans and primates are limited to apes. Born april 10, 1973 in the Netherlands, I graduated from Utrecht University in behavioral biology in 1996. I was fortunate enough to do a double MSc thesis: one on male orangutan behavior on the Indonesian island of Sumatra (supervised by Sri Suci Utami, Liesbeth Sterck and Jan van Hooff), and a second on arid shrubland ecology in Burkina Faso, Africa. After working as a project manager in unrelated fields I return to my passion in 2008 to pursue a PhD in primatology.